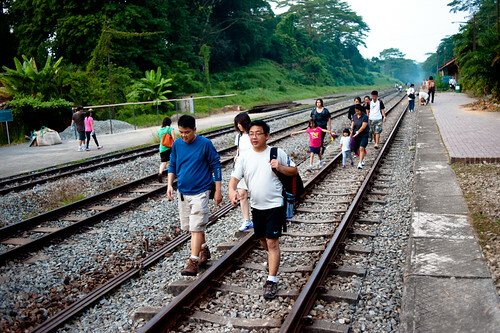 When I started documenting the KTM railway closure in Singapore, I had decided I would do no more than a series of 5 postings documenting the closure, the people and of course, the trains. 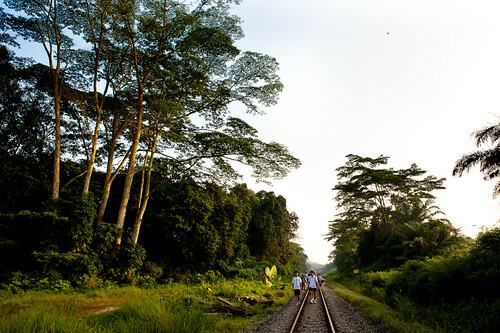 During the frenetic days leading up to the closure, I had taken a trek from the rail mall to the Chua Chu Kang level crossing (a distance of about 3km I believe). 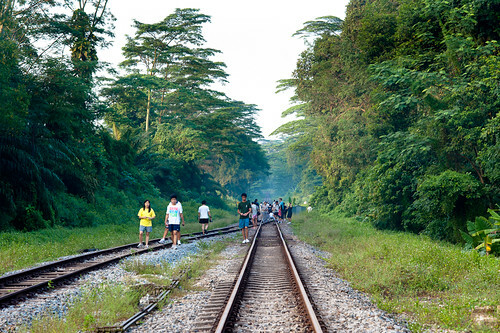 It was tough walking on the sleepers and the ballast and trying to stay alert to both photograph and avoid on-coming trains; however it was a great eye opener and not something one can do everyday in Singapore, and certainly not after the end of this year, where all the tracks will be returned to Malaysia. So when a chance to walk another section of the tracks surfaced, I jumped on it. 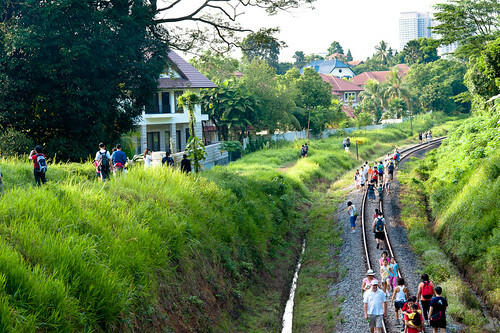 This is a special green corridor update, and with many people flocking to walk the tracks, it only seems appropriate to talk about the importance of preserving the green corridor. 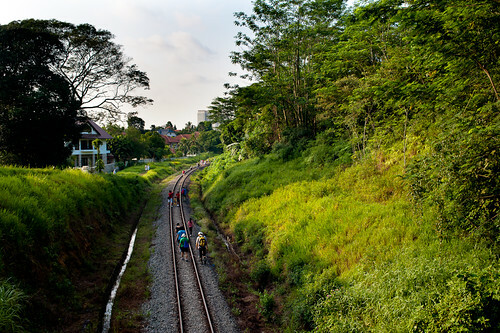 I took the long walk from Bukit Timah station to the Jalan Hang Jebat section of the railway, along the rough stony ballast of the KTM tracks with my good friend CK, Jerome (of the long and winding road blog and the organiser of the walk) and a few other friends a week ago, on the 10th July 2011. 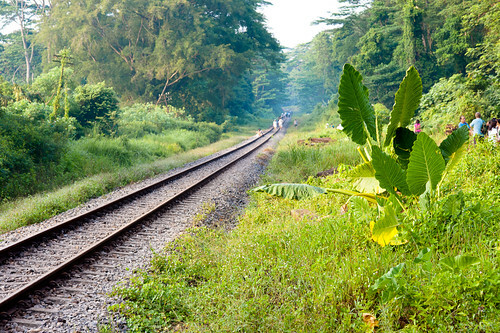 In support of The Green Corridor movement, most of these pictures will be in color to show the greenery of the railway corridor that we are trying to protect and preserve. 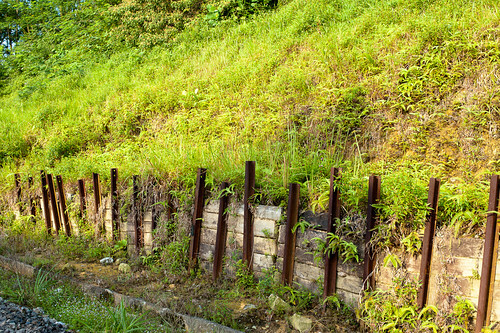 We started off from the Bukit Timah station, where to my dismay the station which I had visited just a few days ago is now fenced up with an ugly green fence, and the big sign that says Bukit Timah railway station has been removed. 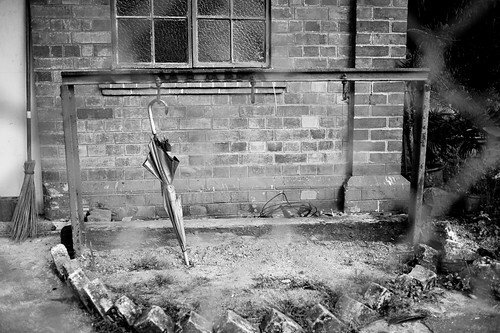 It was said that this umbrella has been there even before the station was closed. Like the station, it is now a part of history. 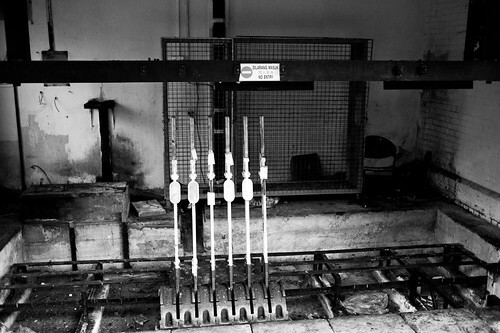 I was surprised KTM also removed the levers I had photographed with such great efficiency. This was to be a “nice Sunday morning walk” as one of the participants put it. We were not in a hurry, but were all there to take in the scenery and make a few photographers. So off we go, in the direction of Holland road, away from the station. 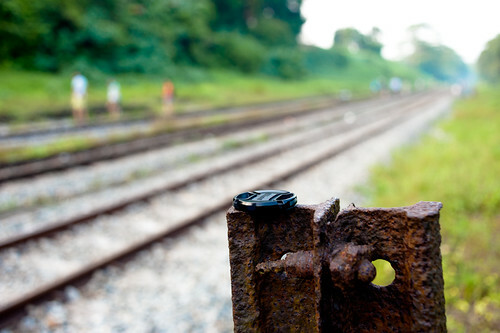 A forgotten item – someone left a lens cap at the station. I left it alone in the hope the owner might come back to claim it. 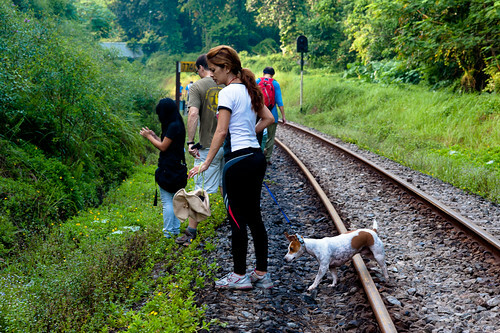 The rail corridor is filled with lush greenery and is home to a natural, untouched ecosystem of flora and fauna, and as I walked the tracks, I can see why it’s important that we try to preserve the corridor, and how critical the call of The Green Corridor movement is. 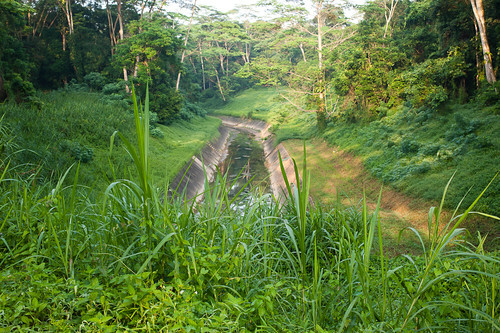 Much of Singapore has already been redeveloped – let’s hope we can retain this small section and keep it pristine. 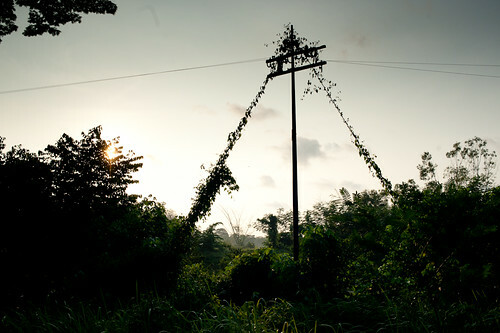 Besides the greenery, there were of course other relics along the way. 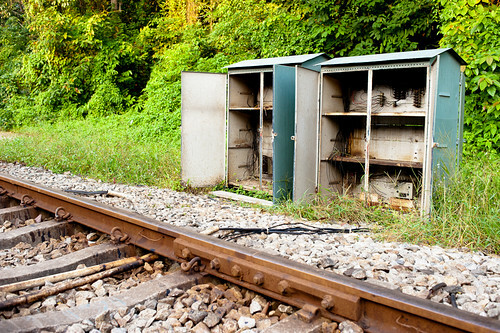 Abandoned Electrical boxes – the guts have been ripped out of them after the closure of the railway. 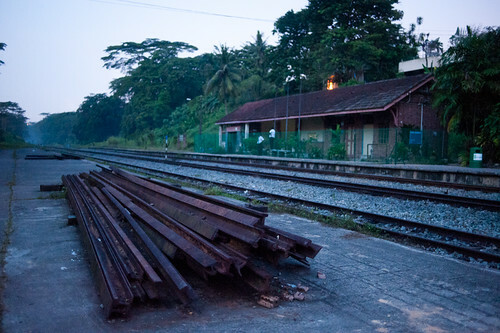 Old abandoned sleepers for the tracks. 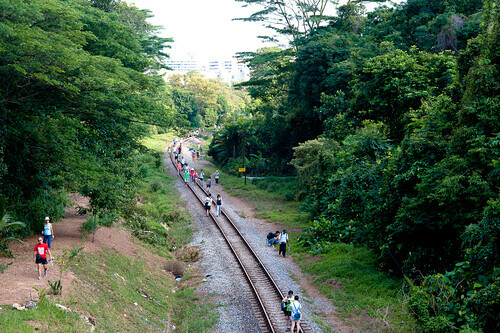 Note the cyclists along the tracks. 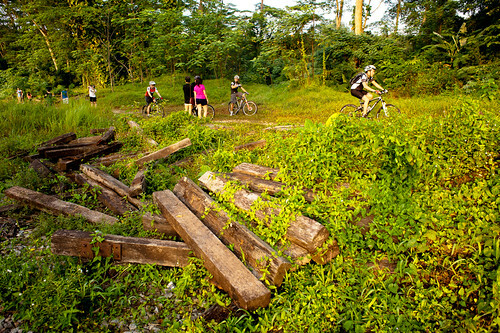 One of the proposals for the green corridor was to have it turned into a cyclist / jogging trail. 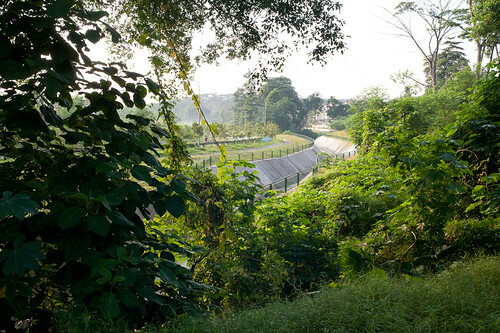 Walking along this section of the track, I can’t help but think of my BMT days in Pulau Tekong, where we had to do our route march through what seems like endless forested areas. 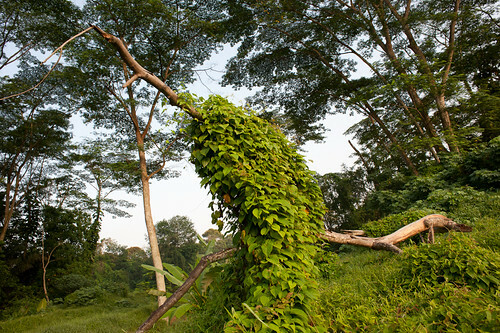 Even man made structures, consumed and subdued by Mother Nature, seem now to blend in perfectly with the greenery. 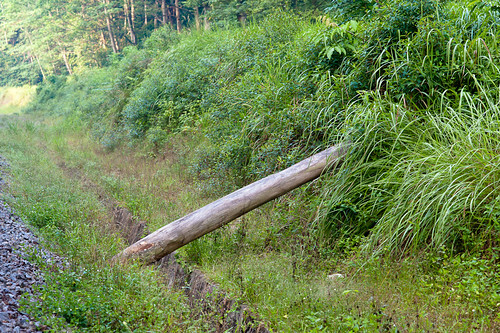 We spotted part of a fallen tree – I wonder if there were incidences of trees falling across the path of a KTM train and if so, how would the KTM workers clear it in time for the passing train? Something to research on…. 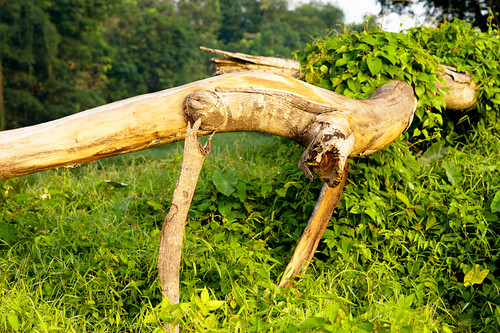 A fallen tree becomes part of the ecosystem by providing a habitat for other flora and fauna. 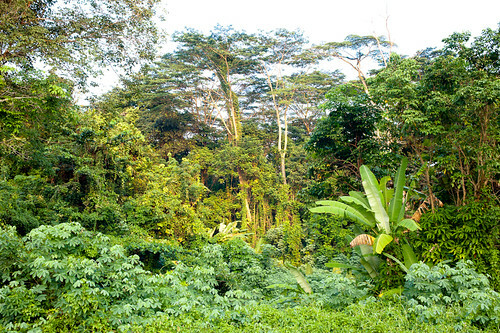 I can’t help but be awed by the lush greenery surrounding us. This is not something you can see in the city areas with trees that were planned and planted according to our whims. 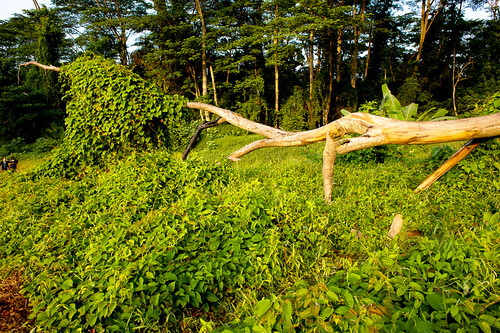 Over here, nature has its own way of arranging things. We were now over the top of a small stream. 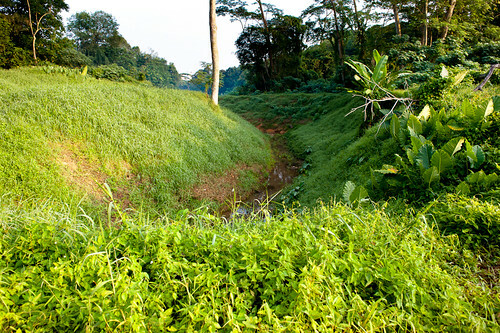 On our right the stream extends beyond sight…. 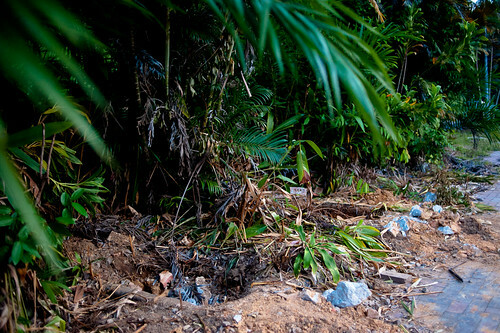 On our left, we can now see where it leads to…. 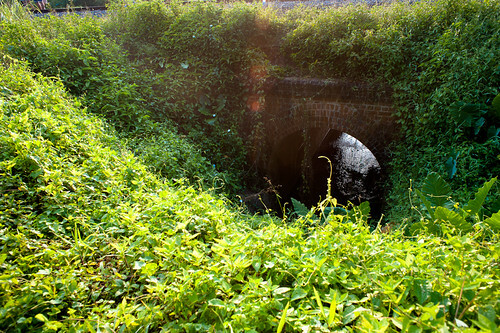 a man-made brick culvert. Tracing the water, we can see it drains into a large canal. 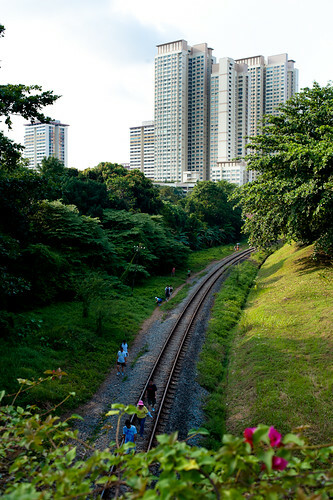 This view offers a peek into urban Singapore. 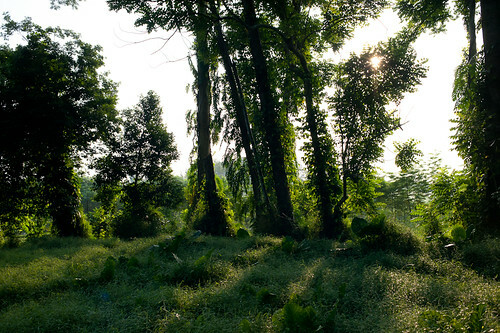 The weather got warmer as we walked; nevertheless the greenery provided some much needed shelter at times. 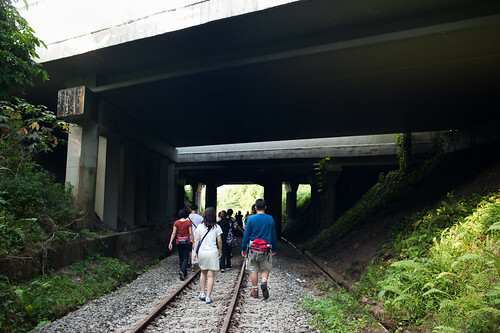 A man made canal crossing under us as we walked the tracks. As a dog owner and lover, I just have to photograph our canine friends. This one walked the tracks as well! An overhead bridge was in sight. Jerome led us along this dirt path adjacent to the tracks, from where we could get to the top of the bridge for a breather and a good overhead view. 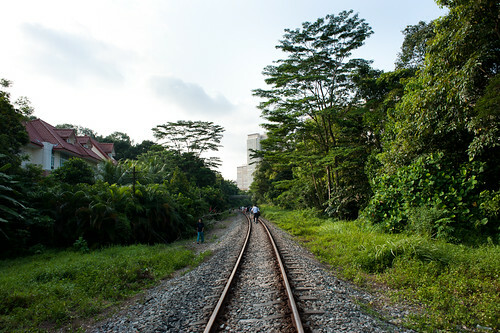 We were now on the bridge along Holland Road, and from here we have a good view of both sides of the tracks. The early morning sun was glorious, and as a photographer, the light couldn’t be more perfect, even if temperatures were hot! 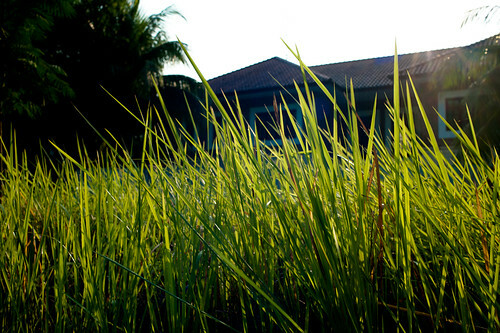 Basking in the sun – it has paid off to start the walk from 645am in the morning! These appears to be recycled track materials that were reused. 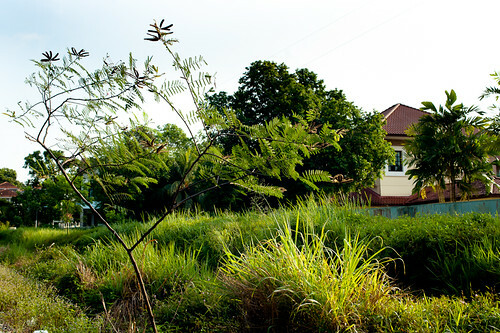 Soon, we passed by the Holland village area. Note the Jelita Cold Storage on the left. with the weather and humidity being what it was, it was tempting to head towards it! 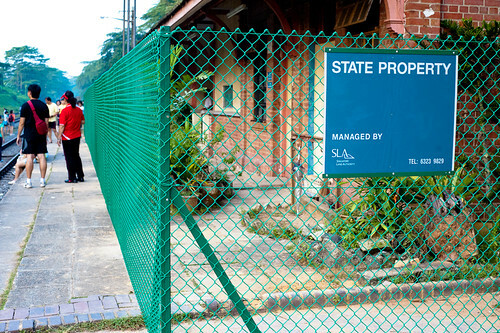 We passed by the now disused former building of Raffles Girls’ School. 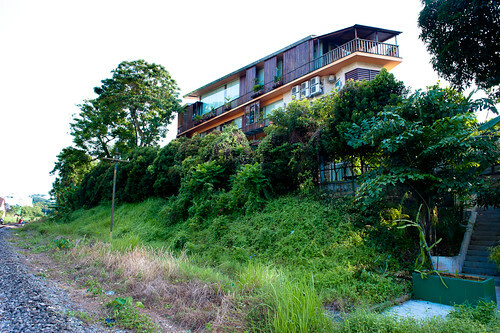 A funny looking house we passed along the tracks – does anyone know what’s the name of this place? We were now pretty tired and hungry – we have been here since 645am and it was around 10am I believe, when we first caught sight of an overhead bridge in the distance. That is the Ghim Moh area, and the planned ending of our trek. 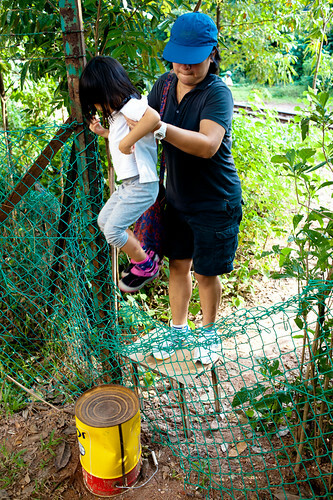 An opening in the fence affords a way off the tracks into Ghim Moh estate. Apparently this “unofficial” exit has been used for a long time – the stool and the overturned metal container was already there long before our walk! We then went over to the overhead bridge for a last look at the tracks before a well deserved breakfast. 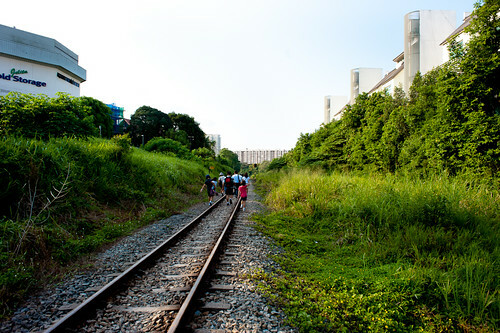 I like this view of our HDB estates overlooking the tracks. And with this picture, we have come to the conclusion of this post and the first part of this walk. This is the end of the walk for most in our group. 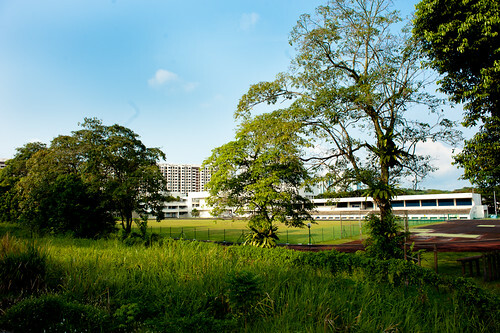 Ck and myself decided to press on in the direction of Buona Vista / Queensway area after breakfast, and in the next post I shall talk about that walk. Till then, hope you have enjoyed this post. 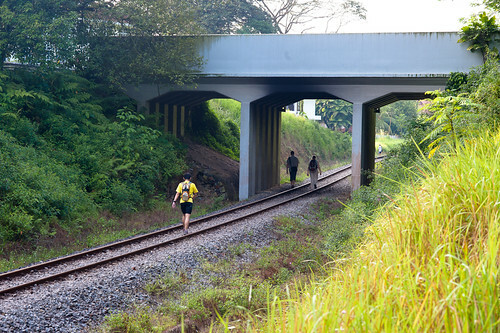 From today till the end of the month of July, there will still be a short 3km section of the tracks from Bukit Timah station to the Rail Mall available (the opposite direction of where I walked in this post). 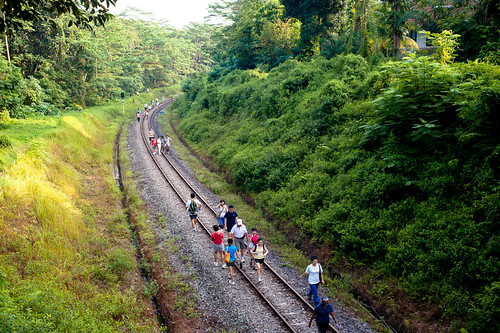 Don’t just read about it – go walk the tracks while there’s still time!